Albert Arnold Gore Jr was born on March 31st 1948 in Washington DC. Al's childhood was spent mostly between a hotel room, the nations capital during the school year and his family farm in Carthage Tennessee. Later on in his education Gore attended Harvard earning his high honor degree in 1969. When talking about the Vietnam War Al Gore turned the other way. but he said that his sense of civic duty drew him to enlist in the U.S Army in August 1969. After basic training, Al was assigned to write for The Army Filer as a military journalist. Sadly, with seven months left of his enlistment he was shipped to Vietnam in January 1971. Shortly after Gore returned to the states in 1971 and worked as a reporter for the Tennessean. Al Gore became interested in politics and uncovered political and bribery cases that later led to convictions. Still working for the Tennessean, Gore began studying philosophy and phenomenology at Vanderbilt University. Soon after he enrolled in Vanderbilt's Law School. Two years after Gore dropped out of law school in order to run for U.S House from Tennessee. He was elected four times and in 1984 he successfully ran for a seat in the U.S senate. Al Gore expanded the internet by pushing the High Performance Computer and Communication Act of 1991. Gore made a bid for the Democratic nomination for the presidency in 1988. He won five southern states, but eventually lost to Michael Dukakis. Bringing him up from his loss he was chosen by presidential candidate Bill Clinton to be his running mate in 1992. They were elected into office that year and re-elected in 1996. Al took a big step and started his own presidential campaign in 2000 with his running mate Joseph Lieberman. Gore won the popular vote, but in the end he was defeated by George W. Bush after five weeks of legal argument over voting procedures. After being defeated by George W. Bush, Al Gore turned to things he learned by his Harvard Professor Roger Revelle. The professor taught things about CO2 in the atmosphere. 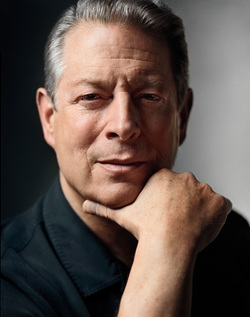 At first Gore used his knowledge to work towards funding but soon worried that the CO2 actually causing global warming. With a little push from his wife Tipper he dusted off an old slide show and showed it to concerned citizens. Gore saw this as an opportunity to start a new career and create awareness that global warming is a crisis. In December of 2007 Al Gore accepted a Nobel Prize for his work on global warming. He shared the prize with the Intergovernmental Panel on Climate Change and stated "make the boldest moves, or stand accountable for their failure to act". When Al Gore decided that he wanted to be in the field of Climate Change he had to make the decision of leaving politics. Mrs. Gore had been involved in politics as well, but with Al leaving this made it difficult for the couple to catch up to one another. Mrs. Gore also left politics and had moved on to her interest in photography. Friends said that if Mr and Mrs. Gore hadn't left politics they probably would still be together right now. But since their lives were changing and their time together was slim they started to drift apart and realize that they were living different lives. After 40 years of marriage they separated in 2010. Gore spends most of his time traveling, working and presenting to people all over, and doesn't have much time with his four children. The issue that Al Gore feels so strongly about and is trying so hard to reach out to people is global warming. Global warming is a HUGE subject, but what Al is focusing on is green house gasses. His professor taught him about what the CO2 levels are doing to the atmosphere. While our world burns oil, gas and coal, the emissions are entering our atmosphere and it is causing heat to be trapped in the layer. This means that heat will be accumulated in the atmosphere making the Earth heat up. This also causes dangerous weather from extreme rainstorms to drought. This effects our global community because it is happening world wide and is killing our earth. Al Gore has taken his calling and has worked on making people aware of this crisis. Some of the things he has done to create change are things such as in 2004 he co-launched the Generation Investment Management, he and The Alliance for Climate Protection created the We Can Solve It organization, Gore has been traveling around the world presenting his keynote presentation on global warming and has received standing ovations, he has presented about 1,OOO times according to his monologue in his documentary/movie An Inconvenient Truth; in 2007 Al was the main non-official representative for the United States in the United Nations Climate Change Conference in Bali, in 2007 during Global Warming Awareness Month, Al Gore and Richard Branson announced the Virgin Earth Challenge which was a competition offering a $25 million for the first person or organization to produce a viable design that removes atmospheric greenhouse gases, on July 17th and 21st of 2008 he gave a speech to set a goal for the United States to replace the use of carbon based fuels and start to use Green Energy, also to commit to producing all electricity from renewable sources such as wind turbines in the next ten years. Two prime examples of spreading his awareness is producing the movie An Inconvenient Truth, and speaking to children all over at amazing events such as We Day. He also has written multiple books such as Our Choice: A Plan to Solve the Climate Crisis, The Assault on Reason, An Inconvenient Truth, Earth in the Balance and Joined at the Heart.